Last October, Lydia Callis – who has been signing her entire life – found herself tongue-tied. As she stood beside Mayor Michael Bloomberg, her face – and hands – were broadcast onto millions of TV sets, breaking the news about utter destruction that was sweeping Manhattan in the form of Hurricane Sandy. She racked her brain for a visual equivalent of the loose crane trembling at the Freedom Tower. Callis, 30, grew up interpreting for her mother and three deaf siblings, and signing was her first language. After coming to terms with signing as her destiny, she founded an interpreting program, LC Interpreting Services, and now works as a freelance interpreter. But the hurricane made her realize she has an even greater purpose: to improve life for the deaf community in New York, where she says conditions leave much to be desired. Graduated from: Phoenix College, majored in deaf studies; RIT’s National Technical Institute for the Deaf, Bachelors degree in interpreting. Rochester has the highest per capita number of deaf people in the United States. Previous jobs: I was recruited to RIT after graduating from Phoenix College, so I moved there, where I earned my Bachelor’s degree and worked as a staff interpreter for six years. Years in the business: I’ve been signing since I was a baby – sign language was my first language. I come from three generations of deaf family members; my parents, two sisters and brother, and two nieces are deaf. What brought you to Manhattan? I worked, mentored, and moved up the ranks at RIT, so my checklist was done after six years. I needed new challenges, so I moved to New York and was very confident that, with my skill level and experience, I would find work. And you did. Yes, I’m a freelance interpreter – that’s what most interpreters do. Staff positions aren’t really available in big cities like New York. You’re arguably most recognized for your work with Mayor Bloomberg during Hurricane Sandy last October. He only has interpreters for immediate emergencies. He was kind enough to let me stand so close to him when the camera people wanted me out of the way; I told them that interpreters must stand close by or else the camera cuts you out. What challenges did those conditions – a city of about 8 million people under extreme duress – pose for you? I didn’t get briefings as to what was going on, so I quickly had to think about different types of signs I could use to portray things Bloomberg was saying — and there aren’t signs for everything. The emotional aspect was also tough. After the hurricane hit, I was by Bloomberg’s side for almost 48 hours; I barely slept. Then I had to tell people about homes lost and lives lost. I have a tough skin, but it’s not the toughest in the world. Did you always know this was your calling? You might say it’s my destiny, given my background, but I was originally going to school for interior design. After being away from my family for almost two years and realizing I forgot some signs – if you don’t use it, you lose it – I changed my major. I hold communicating with my family very close to my heart. Best part of your job: Interpreting people who are really making a difference in society as a whole for the deaf community. Most challenging part of your job: Sometimes you’re in situations where you’re telling someone they’re dying or have a disease or they’re being hired. That’s part of the job. But then there are great times – you’re interpreting for people getting married or having a baby. You’ve always wanted to interpret for: Someone winning the lottery. What are you working on now? I’d like to be more involved with educating and advocating. I was my mom’s interpreter 20 years ago, and I watched her go through a lot – I don’t want to see my nieces go through the same oppression and face the same inequalities. I started a cultural sensitivity program where I’m reaching out to big companies in New York City about making communication easier with deaf employees. For example, offices should have video phones and provide interpreters and captioning for videos. Do signs differ depending on dialect – say, between New York and Texas? Yes; sign language is not universal. It depends on your area and accents. In Texas, for example, signing is more slow-paced than in New York City. A government official in the south would probably have a different way of speaking, and I would mimic that. How people talk and act – the rate and pace of their speech – comes through one’s signs, body language and facial expression. What would people be surprised to learn about your job? When hearing people meet deaf people, it’s often “deer in the headlights” syndrome. They don’t know what to do. There are so many different ways to communicate if you can’t sign – you can type on your cell phone and show them or write something out with pen and paper. People also don’t realize sign language isn’t just signing. It’s also gestures, facial expressions and body language. So during Hurricane Sandy, I was really just doing my job. There are deaf immigrants here who first language is not sign language, and there were people hard of hearing who only read lips. So I had to tailor my interpreting based on the audience. Favorite apps: Skype, which is how I communicate with my family – and Pandora, because it lets me listen to music everywhere. Your required reading: Meditation and journaling. Sometimes in my job, I want to break out in tears – but I can’t. So I write about it. Also, I like meditation because I live in New York City. What’s at the top of your bucket list? I’d like to become legally certified to interpret in a court. A lot of deaf people are being undermined in the court system, and there are only a handful of certified legal interpreters. If you could star as a translator in any TV show, it would be: Switched at Birth. Take a sign language class and see how well you pick it up. Then, go out and socialize with deaf people and see whether you enjoy the culture. 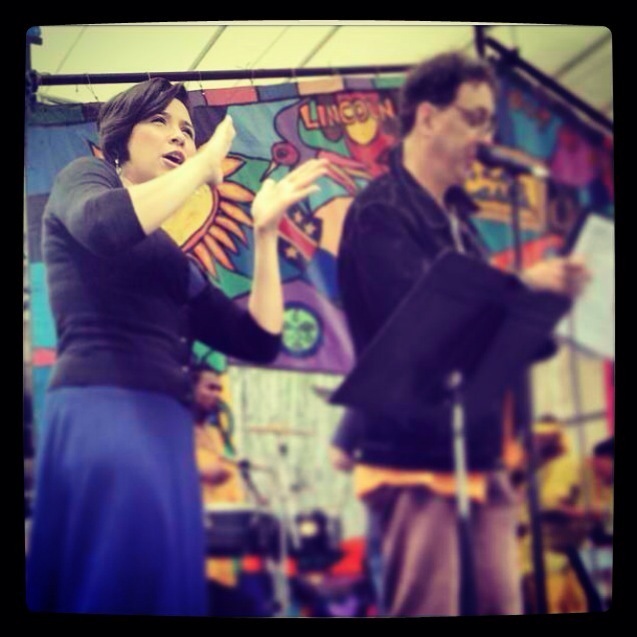 Observe a sign language interpreter and see what it’s like. If you’re still set on this career path after steps one and two, sign up for an ITP (interpreter training program). You can follow Lydia on her blog, SignLanguageNYC.com, on Facebook and on Twitter. This entry was posted in Cool jobs, Small Business and tagged hurricane sandy, mayor bloomberg, sign language, sign language translation by Megan Hess. Bookmark the permalink. Megan Hess is an editor in New York City. No Joe Schmo is her side hustle. You can follow her on Twitter at @mhess4.